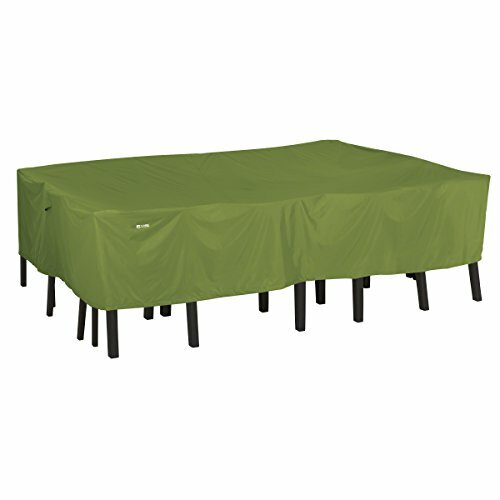 The Sodo Rectangular/Oval Patio Table Set Cover by Classic Accessories offers unique styling with clean lines and solid main body contours while providing reliable protection and peace of mind in wet, windy weather. Our light Raincoat fabric is tough but stores easily when not in use and is made from durable coated polyester with a PVC undercoating. Each cover comes with an integrated storage bag with an exterior label for easy identification. Air vents keep weather out while providing ventilation and minimizing condensation. Extra-long straps tie around furniture legs to secure covers on windy days. Adjustable draw-string tightens easily resulting in a custom-like fit. The Sodo Collection offers more features than other similarly-priced covers with a look that stands out from the crowd. Small: 72”L x 44”W x 23”H, Medium: 88”L x 58”W x 23”H, Large: 108”L x 82”W x 23”H. 1-year warranty.